It's very still tonight, very quiet. The dark is darker than usual and you can feel it as a presence in the room. You put on a record but even that sounds oddly quiet - too far away. You are alone and, strangely, your loneliness feels like a companion tonight. Have you ever been out to sea? In my youth I was a sailor - I've had the opportunity to sail both the Pacific and Atlantic. When night falls on the ocean you learn what isolation is. There is no one around for miles and, even if you knew where they were, how would you get to them? The winds are still, the skies are clear, and you are staring out into a universe of cold stars. Listen, though, are you truly alone? There is life under the water. You can hear the small waves ripple and splash against the hull - but what is that other noise? Something deep, groaning, a bass so profound. Some far off cargo ship plying the ocean on it's way to Europe or Asia? Could it be something else, an antediluvian moan from an indescribable creature of the depths? Do you remember the first time we met it - that dark night at the lighthouse? Did you think you were going to learn about Krabby or Kabuto from Bill? No, Mystery at the Lighthouse was truly about that mysterious sea dragon, Dragonite. It was so huge, dark, and occult approaching from the depths until it was chased away by Team Rocket. In the beginning, Dargonite was the boss. He is the only Pokémon out of the original 151 to be both a member of the 600 club AND available for use in competition. Dratini, Dragonair, and Dragonite are actually the only Dragon-types in Generation I. If you have the right equipment, time, and patience, you can carry a Dragonite from a GameBoy Advance cartridge all the way through Pokémon Black and White and have it available for competition. This may not be the best strategy but it is an option. Dragonite is our old friend, appearing out of the ocean at night to keep us company. So many special characteristics of Dragonite. Even though all of its lore points to it being a sea dragon, its type is Dragon/Flying. No STAB on those Water and Ice-type attacks, buddy. Its pre-evolutions are all blue - Dragonite is orange. You really can't tell that it was once a serpentine azure Dragonair. Honestly, Dragonite is frequently depicted in a goofy enough manner to draw comparisons to Barney. He's no purple dinosaur, though. Dragonite's strength is in its physical Attack base stat - 134 to start out with which you can max out at 403. Strangely enough, even though Dragonite is often described as "fast," his speed is his weakest base stat. Generally, HP, Defense, Special Attack, and Special Defense are all decent. You're going to want to train your Dragonite to weather that first hit and then hit back hard. I don't see much point in bringing a Dragonite up for Speed, so natures to look for include Relaxed, Brave, Quiet, or Sassy depending on your move pool. One thing to note about Dragon-types - the inexperienced frequently think that Dragon-type is going to rule because, hey, they're dragons, right? Stay focused - Dragon is a type just like any other and is extra susceptible to Dragon and Ice-type attacks. 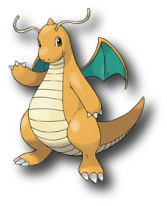 Special note for Dragonite - Dragon/Flying is four times susceptible to Ice-type attacks. Also, many unexpected competitors can learn Dragon-type moves and they will mess you up. Maybe someday you will meet up with me and my Eelektross using Dragon Tail. Some nice moves to give your Dragonite? First off, Outrage is required. STAB bonus, 120 power, and 100% accuracy. Then you have to select whether you want weaker moves with higher accuracy (Twister, Dragon Tail, Wing Atack) or power moves with lower accuracy (Dragon Rush and Hurricane). Dragon Rage is cute, but all it ever does is knock off 40 HP from the target (i.e., no STAB, etc.). Create some diversity and protect against Ice-types by adding one of the nice Fire-type moves Dragonite can learn - Fire Punch, Flamethrower, Fire Blast, and Incinerate are all options. As usual, if you have an empty move slot I would always finalize diversity with a Rock-type move - Rock Tomb, Stone Edge, and Rock Slide are all available. Keep in mind that Dragonite has a huge move pool so you can dress yours up to suit expectations. Two areas to focus on for defensive purposes. First off - get yourself a Dream World Dragonite with the Multiscale ability. This ability means that, as long as your Dragonite is at full HP, any damage it takes is halved. When you have to weather that first hit so you can pound back extra hard, this may give you the protection you need. My friend Gabe argues that a Dragonite with Multiscale can be undone when encountering Sandstorm but I'm not so certain, since the damage from Sandstorm won't be taken until the end of the round. Let me know your results. The second area to protect against are Ice-type attacks which may take you out before you can smack back. A Yache Berry will help you there. If you are having difficulty beating a Dragonite, get yourself an Ice-type, train it for speed and give it a pounding Ice-type move. That should clear up your problem quickly. I won't give too many details but there is a Cloyster out there that frequently makes me cry. I hope that a lot of people have had the opportunity to get out to the Midwest Gaming Classic and meet up with the PKMNcast crew. If not - if you are sick at home alone like me, or out to sea - hopefully a midnight Dragonite will come to keep you company.